These are citizen soldiers from the more wealthy sections of the "low cast", called up to fight in times of need. Although part time soldiers, they are well armoured, and have some training in war. 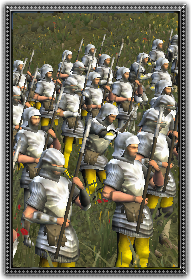 Couple this their effective and versatile Goedendag, and you have a capable flanking unit.